Indentification of this design as number 118 is original to Rakusan who designated this woodblock print as the 118th design published in his main sequence. However, 118 is actually the eighteenth of thirty-six woodblock prints in Rakusan's second main sequence series, 篁子生画選, Koushisei Gasen, lit. 'Koushisei's Print Selections' (usually called here the 36 Series). Like most 36 Series designs 118 has the same signature and seal combination on every copy. Therefore, for 118 only a single extended edition I (which includes potential reprintings both before and after World War II) can be distinguished. It is usually only possible to date an individual loose print of 118 with edition I markings by listing approximate potential ranges of 1934-1941 and 1948-1955. The earliest 36 Series prints were delivered tipped into recessed wells of presentation sheets embossed in their lower margins with the series title. Because all early edition I prints once had these presentation sheets, a copy which retains its presentation sheet must have been printed during the 1930s. After his supply of presentation sheets was exhausted, Rakusan distributed subsequently-reprinted copies loose. However, because many early prints have subsequently been detached from their presentation sheets, absence of a presentation sheet is not in itself diagnostic of a later printing. Some leftover earlier-printed copies on presentation sheets of 118 and a few other designs were still being distributed for a few years shortly after World War II, when by then most designs in this series were only available as loose sheets. The Rakusan project which produced 篁子生画選, Koushisei Gasen, resulted in two related series of woodblock prints. Each print of the 36 Series is intimately connected to a group of prints with the same subjects in the Fan Series. Together these subject-related prints in the two series constitute a theme. Each theme consists of a quintet of monochrome Fan Series designs (one design in each of the five fan shapes), plus one polychrome 36 Series design which illustrates the theme subject. The theme is labeled here by the original Rakusan number of its 36 Series design followed by the subject. 118 is the 36 Series design of the 118 Winter Chrysanthemum and Narcissus theme. Apparently, Rakusan had initially intended to have a separate chrysanthemum theme. In June 1934 the delivery documents for Fan Series installment four included a preview announcement of a theme entitled 菊, kiku, 'chrysanthemum', to appear the following month as theme 113. Although installment five was expected in July 1934, between installments four and six a monthly delivery was skipped. It is possible that problems with this theme contributed to (or were caught up in) that delay. In any event when installment five appeared in either July or August 1934, another theme had been substituted as 113. Chrysanthemum designs eventually appeared in these series only as part of a compound theme 118 Winter Chrysanthemum and Narcissus in installment six with two other winter themes. The 118 Winter Chrysanthemum and Narcissus theme is an entirely regular theme represented by a complete fan quintet and a color woodblock print. All of the designs in this theme (including the 36 Series design 118) have seal C which indicates carving dates between the last months of 1933 and the end of the first quarter of 1934. The Fan Series designs of the 118 Winter Chrysanthemum and Narcissus theme were printed during September 1934 and were distributed September 15, 1934 as installment six (of twelve). 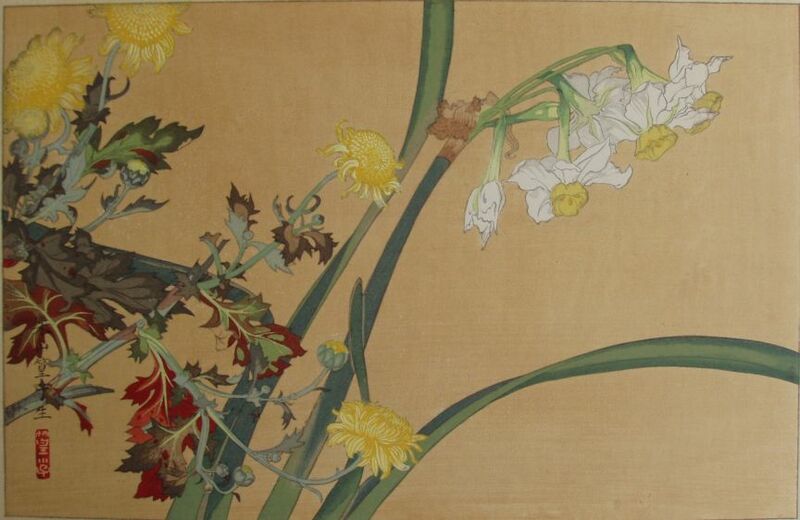 On the delivery documents Rakusan used the theme subject title 寒菊に水仙, kankiku ni suisen, 'winter chrysanthemum and narcissus', which is also the original title of 36 Series design 118 published at the same time. Although fancy hybrid chrysanthemums were previously used in design 38 in the earlier 100 Series (see below), there is no evidence that the winter chysanthemum of this theme would have been included in sketches for that earlier design. However, paintings using this variety do appear among Rakusan's artworks. This theme contains the only examples of narcissus Rakusan is known to have used. The pairing of the winter chrysanthemum and narcissus is a traditional Japanese symbol of the winter season. The woodblock print of 118 was adapted from an actual-size original painting on silk. All of the original prototype paintings for this series are currently in a single private collection. The composition of 118 includes two blooming and budded sprays of yellow winter chrysanthemums (presumably from a single plant) in front of a narcissus with a single bloom stalk with white and yellow flowers. The chrysanthemum foliage is autumn colored, indicating a cold season. For the woodblock print Rakusan replaced the pale off-white background or the prototype painting with a rich tan-yellow. The lead white pigment Rakusan used is subject to discoloration both used as white ink and mixed with other colors. In the edition I example illustrated above, only the two yellow flowers at top left show a fringe of gray discoloration. In a perfect copy these would be the same pure yellows as in the lower blossoms. Other copies show the same effect on the white flowers at upper right. Winter Chrysanthemum (Chinese Aster), Chrysanthemum indicum, 寒菊, かんぎく, カンキク, kan-kiku, lit. 'winter chysanthemum', is an old, cold-hardy, variety. The general name used for all chrysanthemums is 菊, きく, キク, kiku. Today, most garden chrysanthemums are considered forms of Chrysanthemum x morifolium, (C. x grandiflorum), which is derived from C. indicum and related species. Paperwhite Narcissus, Narcissus tazetta var. chinensis, 日本水仙, にほんすいせん, ニホンズイセン, nihon-suisen, lit. 'Japanese narcissus', is a bulb often used for forcing winter blooms indoors.